Sometimes to understand the universe, you need to understand a man. 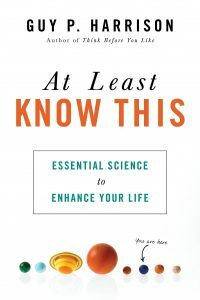 Journalist Guy P. Harrison has been adjacent to the skeptical community for a while now, writing books on religion and more popular treatments of typical skeptical topics, such as 2013’s Think: Why You Should Question Everything. You won’t see him at a lot of conventions, but maybe that’s a good thing, as he’s out fighting the good fight beyond the echo chamber.